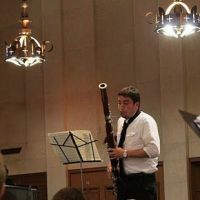 Additional Info: Colin holds a Bachelors Degree in Bassoon Performance from Virginia Commonwealth University, where he studied under Dr. Bruce Hammel. He is currently a Masters student with Marc Goldberg at Mannes College The New School for Music in New York City. His performance experience ranges from Jazz Big Bands to full Symphony Orchestras. He has played in such venues as the Kennedy Center and Carnegie Hall. In the summer of 2008 he traveled to British Columbia to play at the Symphony Orchestra Academy of the Pacific conducted by Arthur Arnold. In the summer of 2009, he traveled to Waterloo, Ontario to participate in the Windfest Chamber Music Festival at Wilfrid Laurier University, where he studied with prolific bassoon artists Nadina Jackson and Chris Weait. While in Virginia, Colin played with the Virginia Wind Quintet as well as the River City Winds. He has served as principal bassoon of the VCU Symphony Orchestra, under Daniel Myssyk as well as the VCU Symphonic Wind Ensemble, under Dr. Terry Austin. In addition, he has appeared with the Richmond Philharmonic, playing bassoon and contrabassoon. Living in Washington, D.C. during the summers, Colin works as a freelance musician, appearing with such groups as the Urban Philharmonic, and going on tour with the Academy of St. Cecilia Youth Orchestra from Damascus, MD. Colin currently plays on a Fox 601 bassoon.